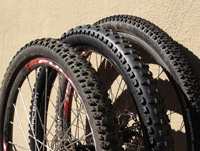 The Deal: bikes are available at this special price for limited time. See Pull down menus below. Warning: sizes always sell out fast so order now *Order now to lock in your sale price / selection. Price may rise when sales goals are met. The Process: When you order, your card will be billed for the full amount. You'll get an auto-email the next business day. For example Fri/Sat/Sunday orders get emails on Monday. Weekends/Holidays are not counted as "days". We have sold thousands of Gravity BaseCamp Front Suspension Mountain Bikes. This aluminum MTB frame has some of the best quality and design for the money we have seen. Customers who own BaseCamp's send friends and family to buy these excellent bikes all the time. "Impressed…I bought a Gravity Base camp...after searching all the major brands...has comparable components and I have to say a better frame than the Specialized Hardrock I just bought for my girlfriend…"
"... Excellent bike, great price, super fast shipping." 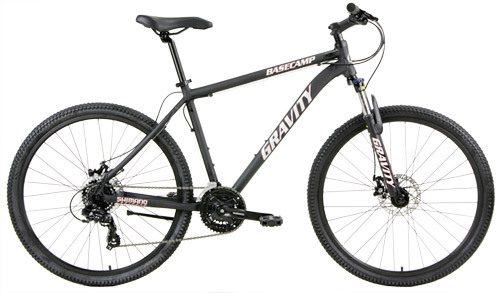 "..Best deal on a (size small) mountain bike-period. High Quality and BETTER than expected." Buy Your BaseCamp now with shipping included to 48 states. Tektro Disc brakes are easier to adjust, more capable and more powerful. Usually found on bikes at 2x the price. MTB Aluminum stem and aluminum microadjust one-piece seatpost. 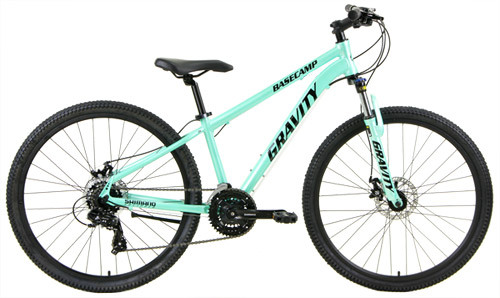 Compare to other bikes at this price and those will have steel stems and heavier/lower quality, harder to adjust; two piece seatposts. Wide range Genuine Shimano 21 speed drivetrain for smooth shifting on rough terrain. The plush suspension fork further smooths the terrain. Lockout and provides maximum efficiency. Incredibly specified with precision Shimano 21 Speed drivetrain, Genuine Shimano Cranks, strong/light Aluminum Alloy rim wheels, Powerful Tektro Disc brakes and Unheard of at This Sale Price = LOCKOUT Suspension fork. 13" - fits most 4'11" to 5'5"
15" - fits most 5'5" to 5'8"
17" - fits most 5'8 to 5'10"
19" - fits most 5'10" to 6'1"
21" - fits most 6'1 to 6'4"
14" - StepThrough (Lowered Top Tube) fits most 4'10" to 5'6"
Standover measured on axis with Crank/BottomBracket. Top tubes slope upwards to the Headtube so please allow for that. Sizing is a personal preference and the choice is ultimately up to the Customer. Between sizes? If you size up, you may touch when straddling the bike.